The Teenage Mutant Ninja Turtles have gone through several iterations over the past couple of decades. From the television and movie screen, they’ve rarely been out of the public consciousness. With that several games have come out featuring Michelangelo, Donatello, Raphael, and Leonardo, including the recent Shadows of the Past. 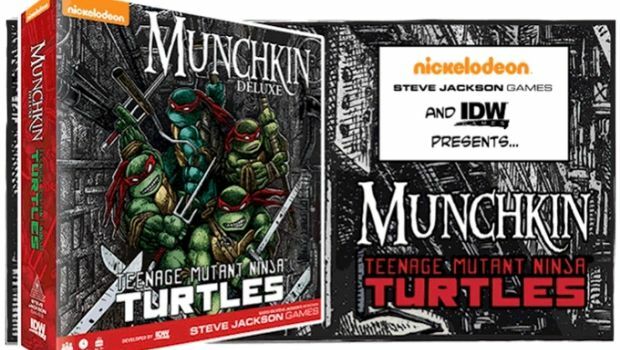 Now IDW is mashing up the TMNT team with another popular game, Munchkin. I was able to ask Jon Cohn eight questions about the game, which is currently funding on Kickstarter. Several different eras of the Teenage Mutant Ninja Turtles exist, from the original comic book incarnation, the 80’s, the 00’s, and 2010’s animated series, three different movie universes, and another new upcoming animated series. Which one does Munchkin TMNT focus on? In this game we are focusing on the current run of the IDW comic series from Kevin Eastman, Tom Waltz, and Bobby Curnow. The deluxe edition has a nod to the original comics by including variant versions of the Turtles in their original art style, while the Deluxe Ultimate version has a whole duoshade version of the game that looks straight out of the original comic series. I offered to let them use art from a picture of Krang I drew when I was 6 years old that’s still hanging in my parents home, but they sadly turned it down. So the Turtles level up or get more pizza power? In this game the Turtles are leveling up as they race across town to the pizza joint, fighting crime along the way. First one there gets to choose the toppings! Not just Foot! You’ll also be kicking some Purple Dragons, Krang’s alien army, Baxter Stockman’s legion of mousers, and a bunch of classic villains. One minute you could be clashing with a bunch of flyborgs, the next you could be brawling with Bebop and Rocksteady. How will you interject the well-known Munchkin humor into the TMNT theme? For me a lot of the humor in Munchkin comes in patching together your character using all these different parts that shouldn’t go together. I love the idea of April O’neal riding Mondo Gecko’s skateboard while dressed as a pizza chef carrying Bebop’s signature chainsaw. There were also a few characters that really begged to get Munchkinized (that’s totally a word now). My favorite is probably Baxter Stockman; he’s a monster card that gets more powerful based on the number of smart phones in the room. Also there are puns. Terrible, terrible puns. Were there certain characters requested specifically by the design team for this edition? Yes. Because Munchkin TMNT can seat up to 6 players, April O’neil and Casey Jones were specifically requested to be playable characters. I was also asked to create variant versions of the Turtles in the style of the original comics which are pretty rad. Personally I’m a big Pigeon Pete fan. He was a character I thought would be a perfect fit for the Munchkin universe, so I pitched him to IDW and luckily they were as excited as I was to include him in this game. It doesn’t seem thematic for the Turtles to trip each other up. Are all the trap cards enemies? For the most part, yes. There are plenty of enemy-based traps like Mouser Ambush, Cranky Croc, or Mutagenic Mishap. On the other hand there are also a few traps that are more thematic like Bad Pizza or Shell Shock. I really wanted to keep the Turtles feeling like a team even though this is a competitive game. One way I was able to achieve this was by making the monsters more difficult, then giving each Hero character a special Team-up bonus. Every single character, including the alternate art Turtles, has a totally unique Team-up power. Leonardo gives a bonus to power, while Michelangelo gets to recruit extra allies. Pigeon Pete’s Team-up lets him dig around through the trash to collect other players discarded items. Of course Raphael hates teamwork and gets a Loner Bonus instead. Will we see other generations of Turtles possibly represented in the future? I sure hope so! Munchkin is a pretty easy game to expand, and there are a whole lot of characters out there that we weren’t able to fit into this game. Not to mention all the crossovers! Looking over the characters in the Kickstarter campaign brought back a lot of memories of different characters in the series, and you can tell from the interview that the designers are having a lot of fun with the game. Be sure to check out the Kickstarter campaign now and kick some shell!